Introduction: Single Incision Laparoscopic surgery has played a key role in the progression towards scarless surgery. 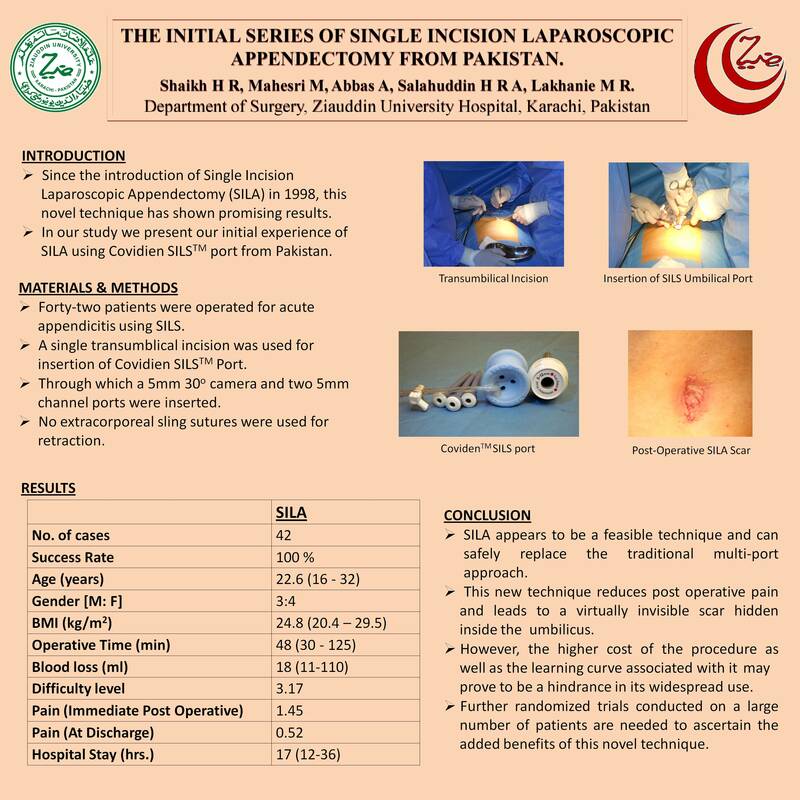 Since the introduction of Single Incision Laparoscopic Appendectomy (SILA) in 1998, this novel technique has shown promising results in terms of less trauma to the body, decreased post-operative pain, lesser complications and earlier discharge. It also gives an excellent cosmetic result and promises to increase patient satisfaction. In our study we present our initial experience of SILA using Covidien SILSTM port. This is the first reported series of SILA from Pakistan to date. Material and Method: After the approval from the Ethical Review Committee of the institution, 42 patients who were operated for acute appendicitis using SILS technique, during the period September 2009 to September 2010 were enrolled in the study. The patients were made aware of the novelty of this technique. A single transumblical incision was used for insertion of Covidien SILSTM Port, through which a 5mm 30o camera and two 5mm channel ports were inserted. No extracorporeal sling sutures were used. The same umbilical incision was used to retrieve the appendix. Results: In our series, male to female ratio was 13:8 with an average age of 28.1 yrs. (17-43 yrs.) and a mean BMI of 22.3 kg/m2 (18.2-32.6kg/m2). SILA was successful in all the cases and no insertion of extra ports was required. The mean operative time was 48 minutes (30-125 minutes). The estimated blood loss was about 18 ml (11-110 ml). There were no post operative complications reported in any of our patients. Conclusion: SILA appears to be a feasible technique and can safely replace the traditional multi-port approach. This new technique not only reduces post operative pain but also leads to a virtually invisible scar hidden inside the umbilicus. However, the higher cost of the procedure as well as the learning curve associated with it may prove to be a hindrance in its widespread use. Further randomized trials, conducted on a large number of patients, are, therefore needed to ascertain the added benefits of this novel technique.